We’d love your help. Let us know what’s wrong with this preview of Precious Vessels of the Holy Spirit by Middleton, Herman. 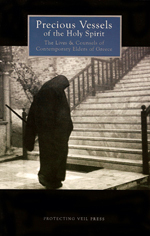 This book contains brief life stories of several 20th century Greek Orthodox men who are considered to be Holy Elders of the Church. To ask other readers questions about Precious Vessels of the Holy Spirit , please sign up. While scanning the selection of books in my Church bookstore I came across this title and was instantly intrigued. As I quickly leafed through the pages several quotes caught my eye and I just knew I needed to buy this book. The only problem was I didn't have any cash on my at the time so I told myself I would have to come back and buy it next week. When I asked how much the book would be the lady told me I could just have it. Come on! She didn't know I didn't have any cash on me, yet here she was just giving the book to me. I took that as an obvious sign that this book was meant for me to read now, not later, so I thanked the lady and ran out of there excited about what just happened and what I was about to read. A wonderful collection of wisdom and examples of piety. The guidance and instruction provided from each Elder individually would be worthy the read. Truly fantastic. I'm certain I will revisit this book many times. I'll admit it, I wanted to enjoy this book a lot more than I did. It was ok. Represents a piety and wisdom that doesn't speak to me.